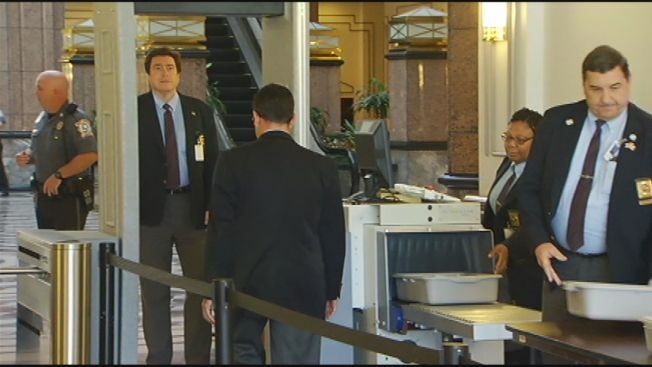 For the first time, visitors to the Connecticut Capitol and the Legislative Office Building will all have to be screened by security. At the entrances to both the Capitol and the LOB, visitors could expect to be screened by contracted security guards and the Capitol Police. The security measures aren’t uncommon. Since September 11, 2001 officials at state and federal buildings across the country have stepped up their approaches to safety. Driscoll says it might take some time for visitors to get used to the new processes like emptying their pockets and walking through metal detectors but eventually it should become a routine. Taxpayers will be providing the cash to pay for the new staff and equipment. According to the Office of Legislative Management, the estimated cost of the new security checkpoints is $600,000.